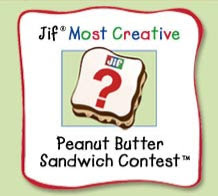 To kick off this week I want to announce The Seventh Annual Jif Most Creative Peanut Butter Sandwich Contest. How would you like your kid to win a $25,000 scholarship fund? If my child was old enough he'd be slaving away in the kitchen right now to come up with a pretty creative peanut butter sandwich. If you think your child makes a mean peanut butter sandwich you might be interested in submitting his/her recipe. Go to the contest homepage HERE to get the scoop. If you don't have a recipe to share but would like to win a trip to NYC so that you can be the judge of the peanut butter sandwich contest then go HERE. Let me know if you submitted a recipe. I'd be interested in trying it out! That last comment is from Stacie Gruwell...it's only letting me post off of my sister's account..sorry! I wish I was creative enough, or rather had the time to be creative. 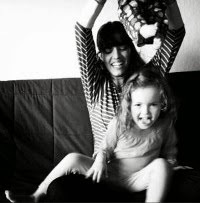 I'd have my son doing that too if he was old enough. but maybe his picasso for of peanut butter and Jelly all over the counter, walls, plate and bread could be counted as creative? Great! Except I think Jiff is the most evil peanut butter there is, other than peter pan and skippy. JIF is delicious. Their crunchy peanut butter is like dessert. You obviously don't have an appreciation for cheap, loaded with sugar, peanut butter.